Heavy duty polyurethane wheels feature easy rolling with a crowned tread. Built with a heavy duty cast iron core, these poly wheels are designed for hard work with a polyurethane tread thicker than ordinary wheels. The poly tread provides non-marking benefit plus increased abrasion resistance. Large hub diameter will accommodate tapered or optional precision bearings. Note: Tapered roller bearing wheels include bearing thrust spacers; hub lengths shown include thrust spacers. Choose the appropriate wheel bearing option to match polyurethane wheel application. 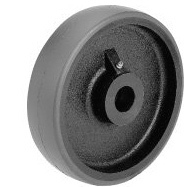 Call toll free 1-888-904-9531 for more information and to order easy rolling, heavy duty polyurethane wheels. NCC-EZPUR420 4 2 2-3/16 1-3/16 700 5/8 and 3/4 "
NCC-EZPUR515 5 1-1/2 1-5/8 1-3/16 800 5/8 and 3/4 "
NCC-EZPUR520 5 2 2-3/16 1-3/16 1050 5/8 and 3/4 "
NCC-EZPUR615 6 1-1/2 1-5/8 1-3/16 850 5/8 and 3/4 "
NCC-EZPUR620 6 2 2-3/16 1-3/16 1300 5/8 and 3/4 "
NCC-EZPUR1030 10 3 3-1/4 1-15/16 3000 1 and 1-1/4 "
NCC-EZPUR1225-3 1/4 12 2-1/2 3-1/4 1-15/16 2700 1 and 1-1/4 "
NCC-EZPUR1230 12 3 3-1/4 1-15/16 3500 1 and 1-1/4 "